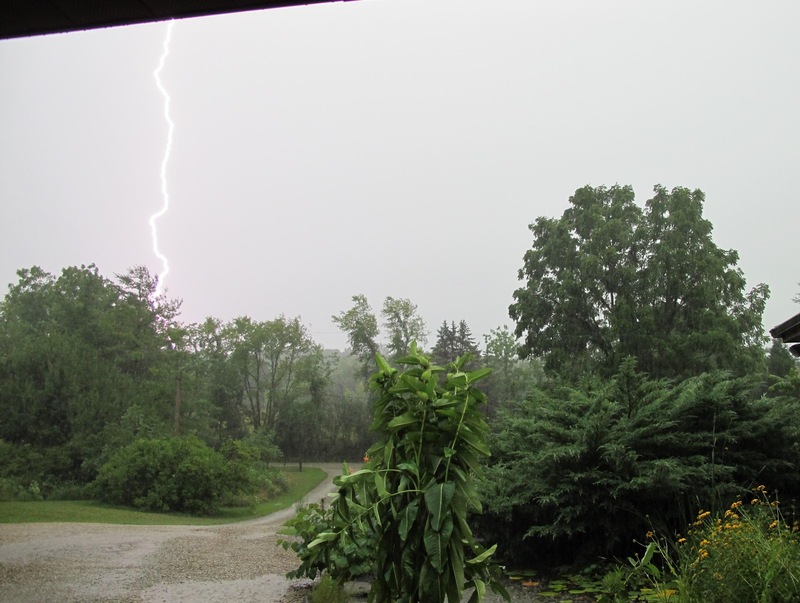 Late last week we experienced four separate storms that produced a total of 1.5 inches of rain over a two day period. The first storm arrived in the early evening, so there was plenty of light for me to sit on the porch and enjoy the action. 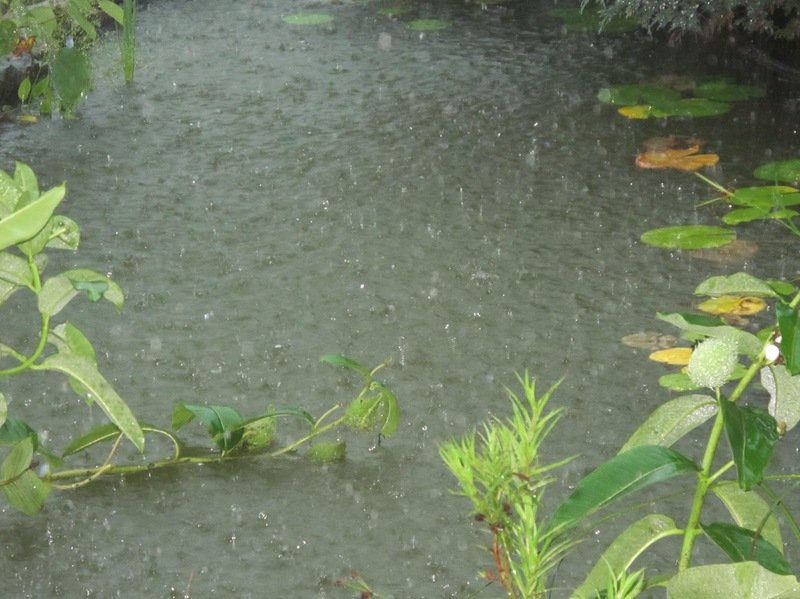 The rain quickly filled the Water Garden to overflowing. The storm lasted a total of 20 minutes and five minutes of that was a straight downpour that gave us 0.5 inches. That’s a rate of six inches per hour. I think we could have soaked up a full hours worth. 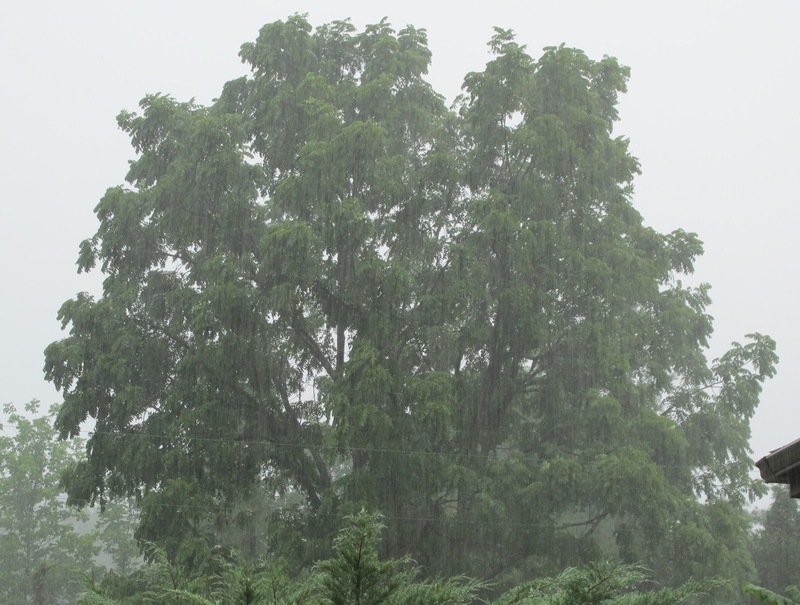 Following the heavy stuff was a gentle rain and a lot of lightning. This bolt struck in the woods across the road. Even though the rain did nothing to recharge our ground water supply, it did rehydrate all of the plants. 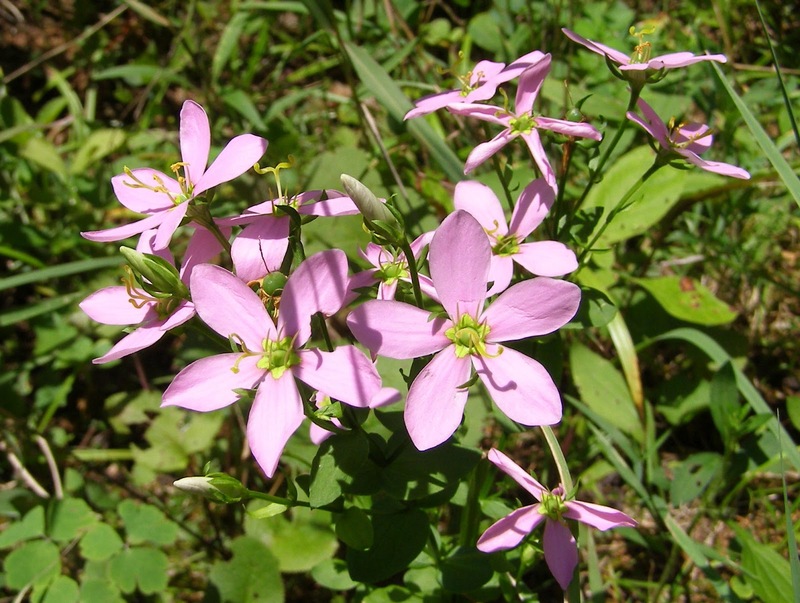 The most noticeable change was the Rose Pink once again producing fragrance. 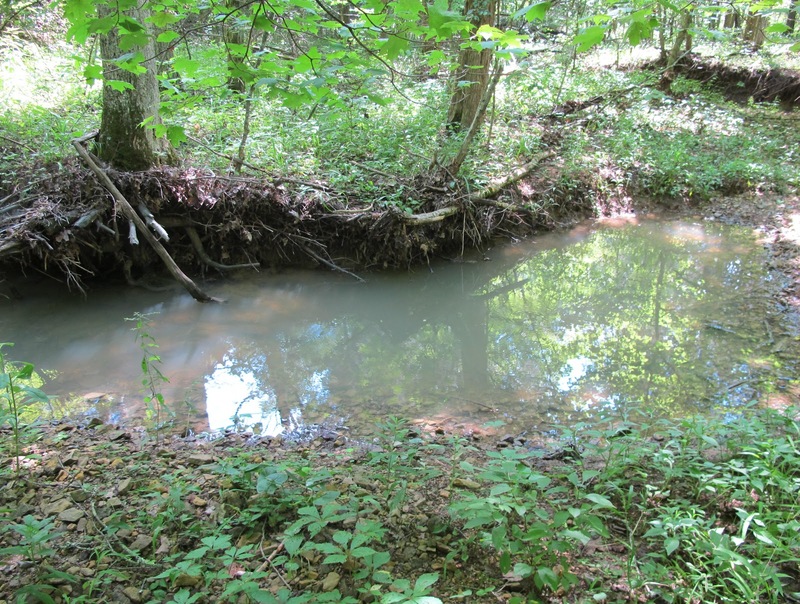 There was no overland flow associated with these storms, but the water that fell in the creek bed made its way to the low points and filled most of the pools. 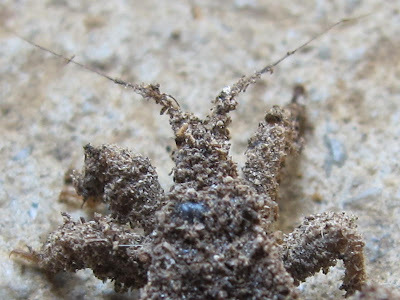 This will ease the stress on animals that need an open source of water. Without additional rain, this water won’t last more than about three weeks. It’s nice and clear now, but that will change with increased animal usage. 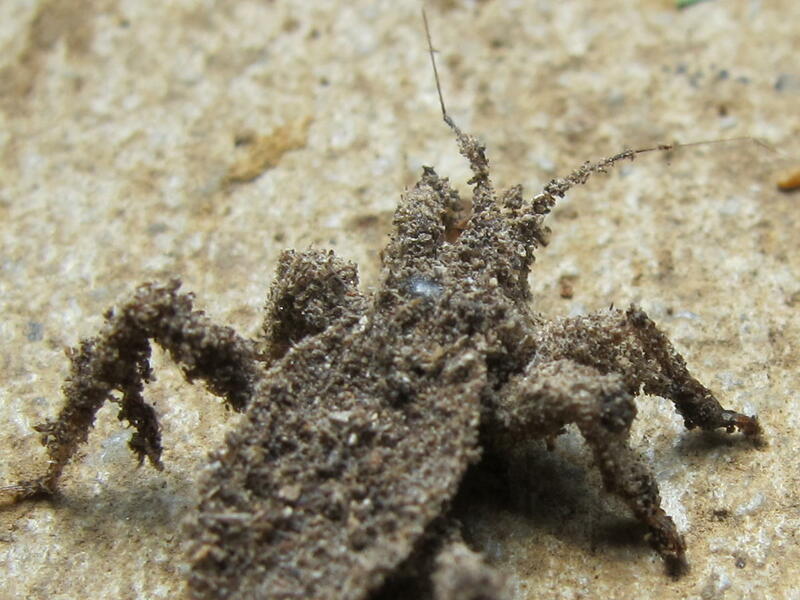 As pools are lost, those that remain become cloudy with sediment stirred up by animal visitors. The newly filled pools are without fish. 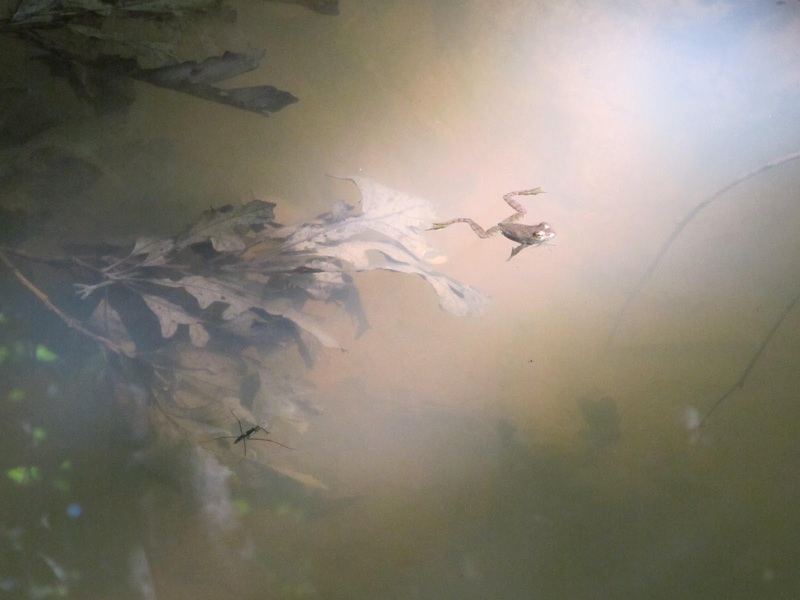 Only those aquatic animals capable of surviving periods without water were around to take advantage of the restored aquatic environment. Drifts of cedar leaves and berries at the downstream edge show that the pools were just at the point of breaking out and temporarily restoring stream flow. It seems that each storm we have is violent enough to remove fruit and nuts from the trees. Those cedar berries are supposed to be attached to the trees to act as food for the overwintering Bluebird population. The amount of fruit lost to the effects of storms and drought make me think this is going to be a tough winter for many species. 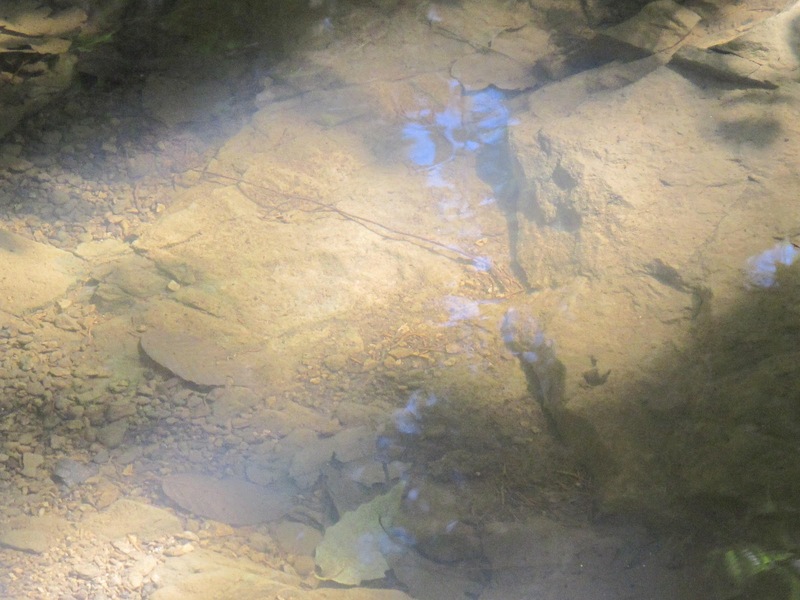 The gravel beds that hold water in the pools are not water tight and allow a trickle of water to move through. 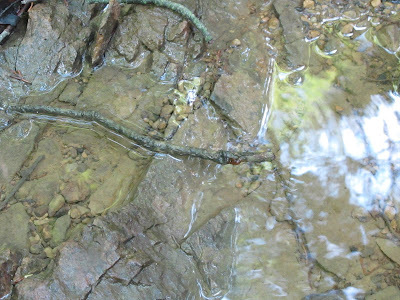 This nearly imperceptible flow can only be seen in those areas of the creek where solid bedrock is exposed. 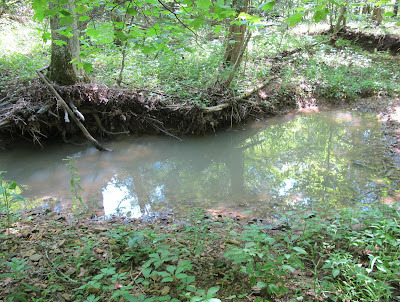 Under normal conditions, this water would be replaced by water moving into the creek from the groundwater reservoir. Because of the extended drought, that water is not available. Where the creek bottom is composed of loose gravel, the moving water is hidden from sight. The rain necessary to end this drought is still somewhere in the future. There’s still time for this year of weather extremes to amaze us with more unexpected developments. 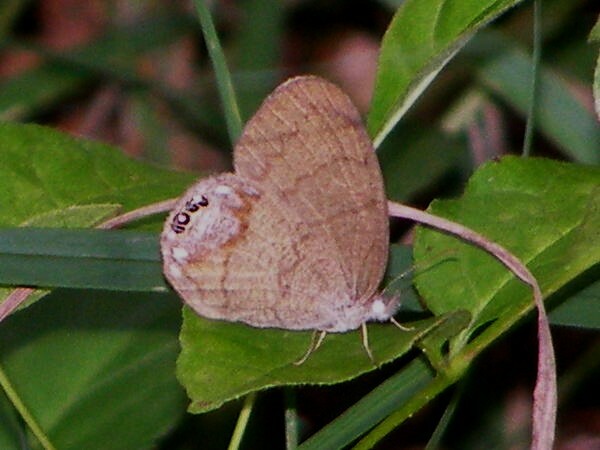 The Common Wood Nymph is the second of the larger Satyr species. 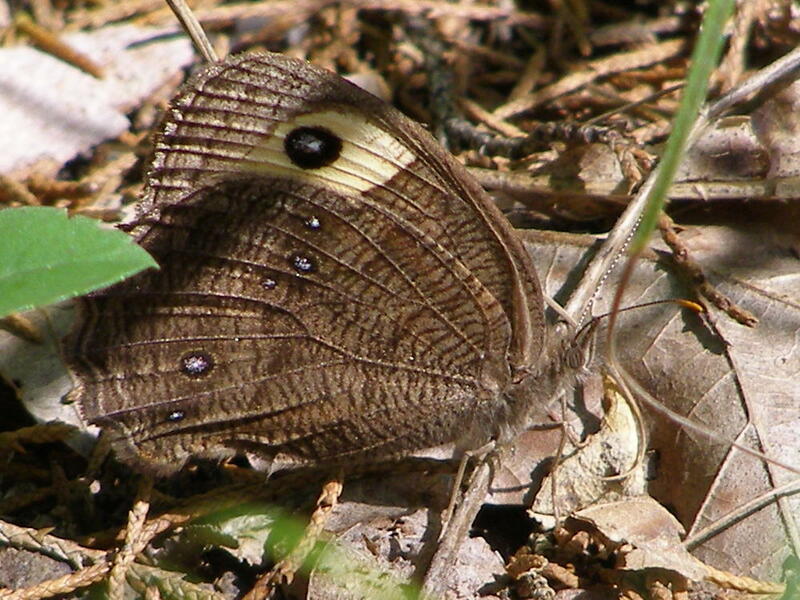 This butterfly is very common and can be found in a variety of habitats, but I tend to find it in the shadow of trees. 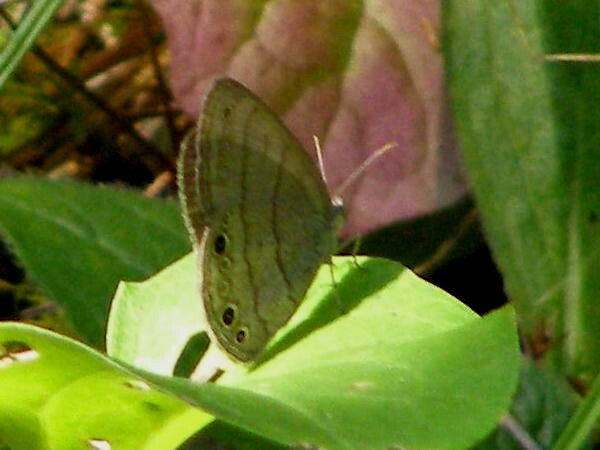 It normally perches near or on the ground. 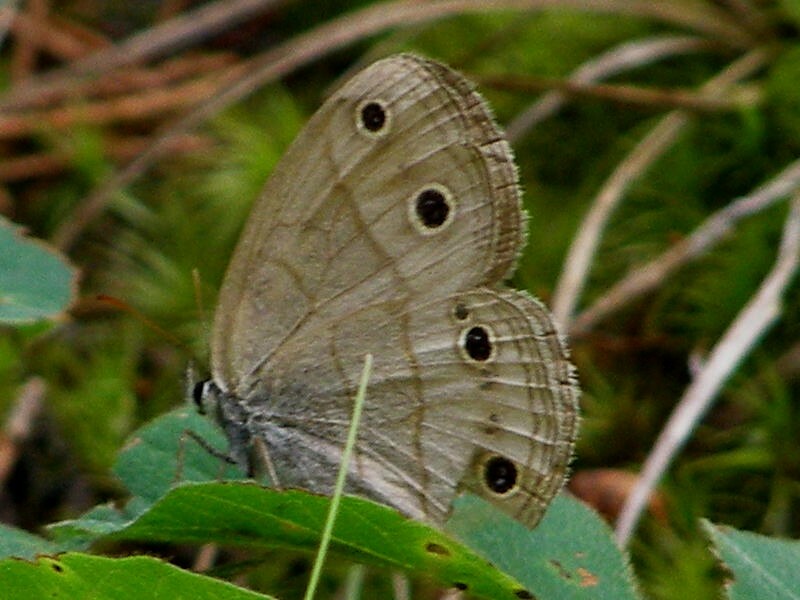 With the forewing eyespot hidden from view, the butterfly is almost impossible to see. 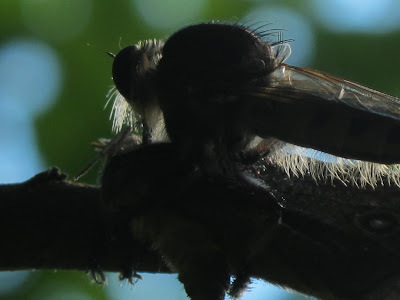 A couple of days ago I watched a large Robber Fly chase after a passing Common Wood Nymph. No capture was made and I thought a butterfly of that size would be quite a lot for the fly to manage. 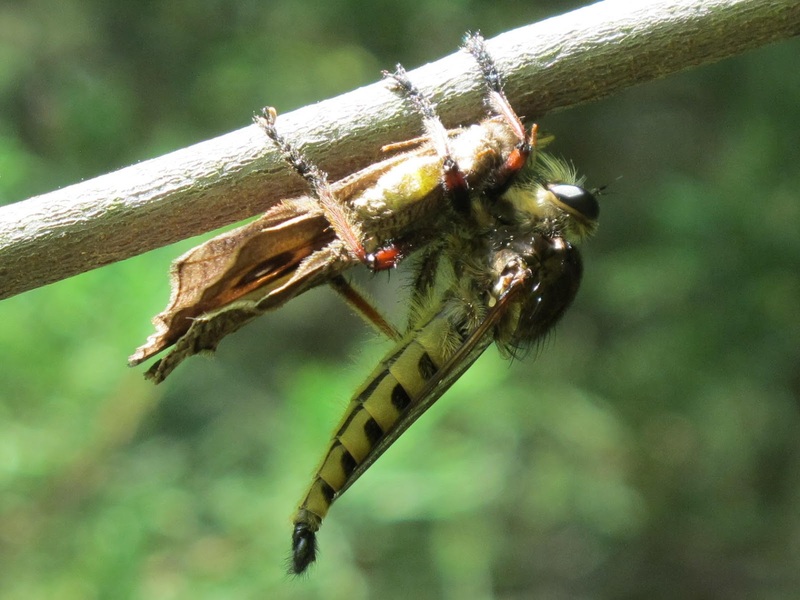 I changed my mind when I found this Robber Fly hanging on to its captured Common Wood Nymph. The fly has inserted its piercing mouth parts into the body of the butterfly and is busy guzzling down the soft insides. 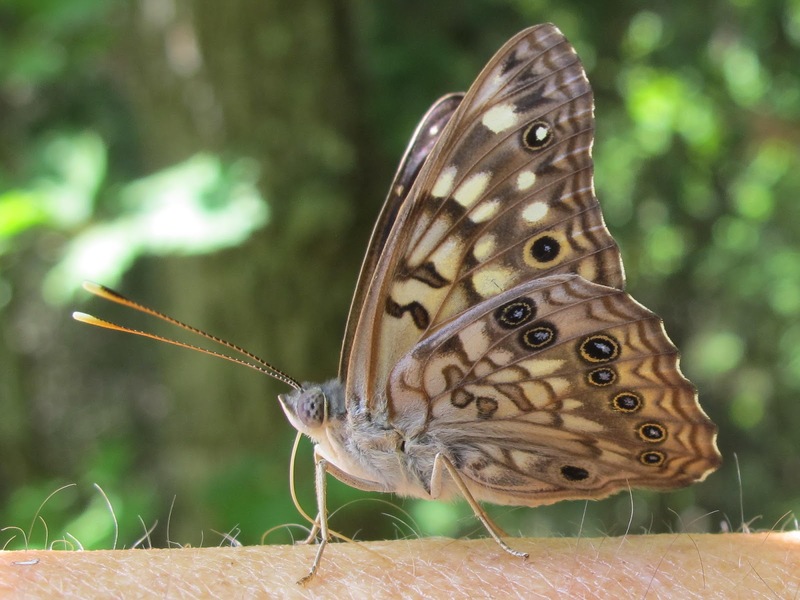 While I was busy trying to overcome my problem of getting near enough to a Carolina Satyr for a good picture, this Hackberry Butterfly presented me with an opposite problem. I had trouble getting this guy to back off far enough for me to get a shot. It first landed on my face and then dropped down to my neck. Eventually I got it to move onto my arm where it sat calmly drinking sweat. The Hackberry Butterfly can sometimes become a nuisance. In cases where they don’t find enough sweat, I’ve seen these butterflies probe ears, eyes, nose and mouth in an attempt to find some tasty liquid. I guess I’m luck I always seem to have plenty of sweat to offer. There are three species of small Satyr butterflies that can be found at Blue Jay Barrens. They all fly low to the ground and share the same brown background color, so it’s sometimes difficult to identify them in flight. 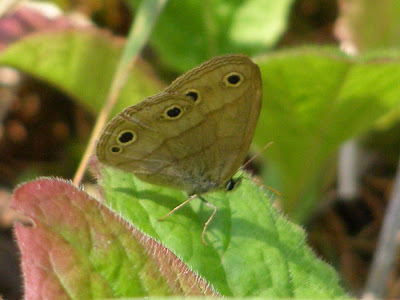 The most abundant of the three is the Little Wood Satyr. 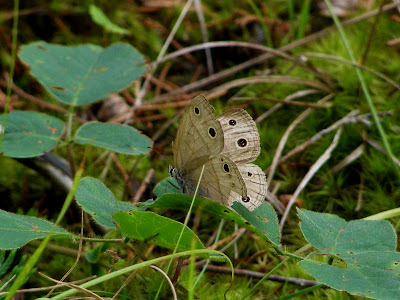 Little Wood Satyrs fly during late spring and early summer. 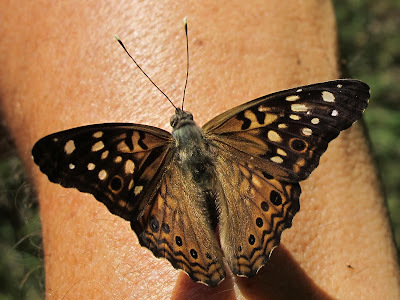 They’re just now reaching the end of their run, so it’s not uncommon to find individuals with torn or ragged wings. 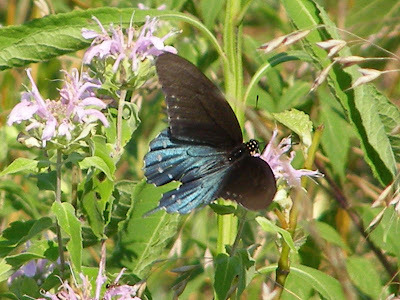 This species stays to the shade and seems to prefer open wooded situations that allow for a thick ground cover of forbs and grasses. 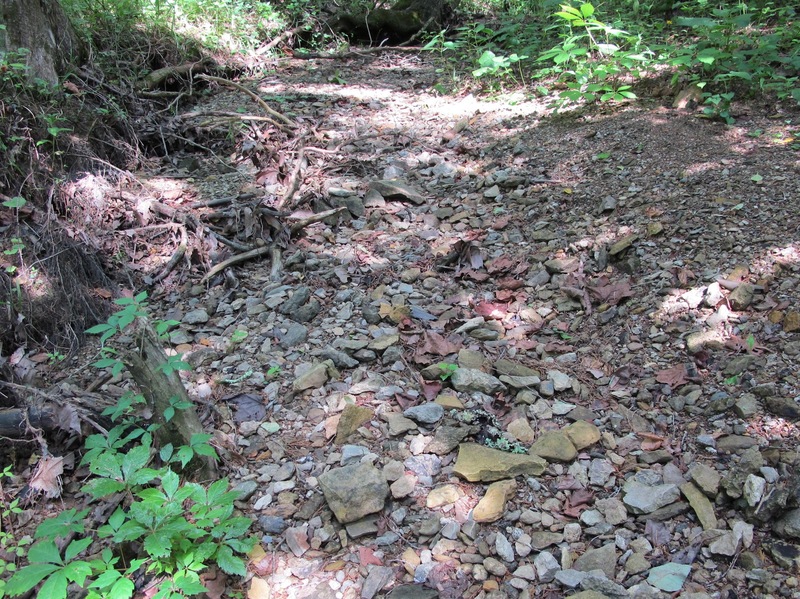 I find it from creek bottom to ridge top as long as the preferred shade conditions are present. The second of the small Satyrs is the Gemmed Satyr. This is an uncommon species whose northern range just makes it into southern Ohio. If you can get close enough to see them, the four small eye spots tightly grouped at the back edge of the hind wing make identification easy. 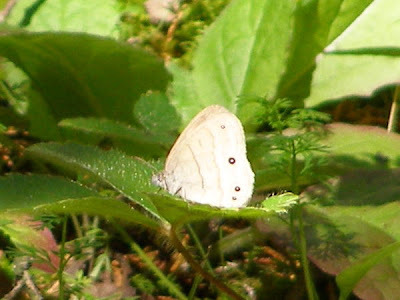 I’ve found this species occasionally on ridge tops, but most often along the creek corridor. All three small Satyrs spend the majority of their time in flight, so it’s hard to catch them at rest. When they do set down on a plant, it’s usually just for a period of a few seconds. If you can find one that has settled for a longer stay, it is easily spooked by any movement, so getting close can be difficult. 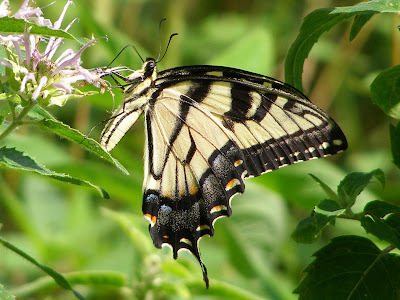 If you have the patience, you have better luck by staking out a likely area and waiting for a butterfly to come to you. 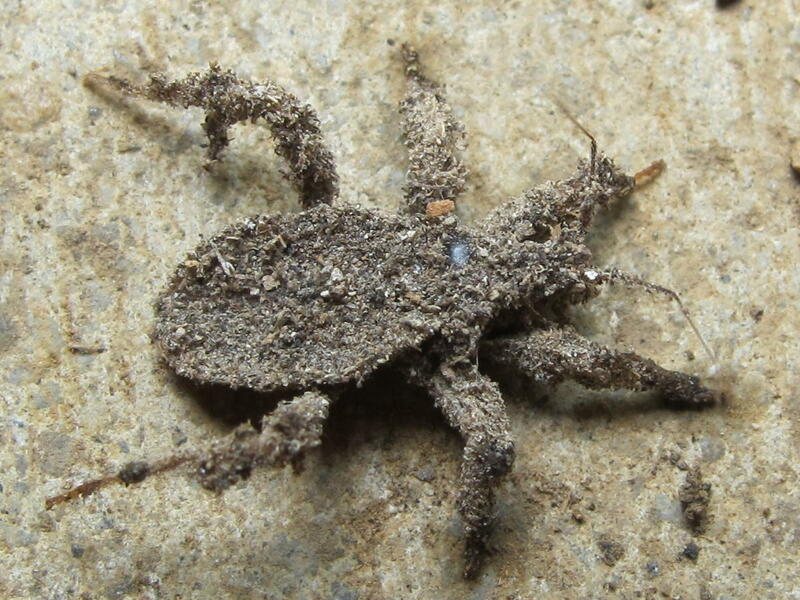 My goal for the day was to get a decent picture of the Carolina Satyr, the third of the small Satyrs. 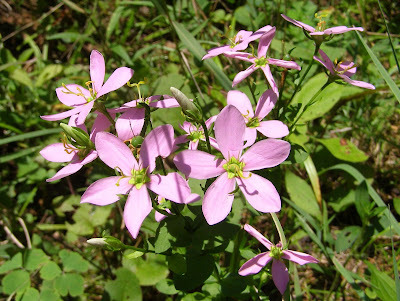 This is also an uncommon species whose range just makes it into southern Ohio. My first photographic attempt was less than satisfying, but at least I could tell I was after the correct species. I usually got just one shot before the butterfly took off. This is getting better, but I’ve still got a long way to go. 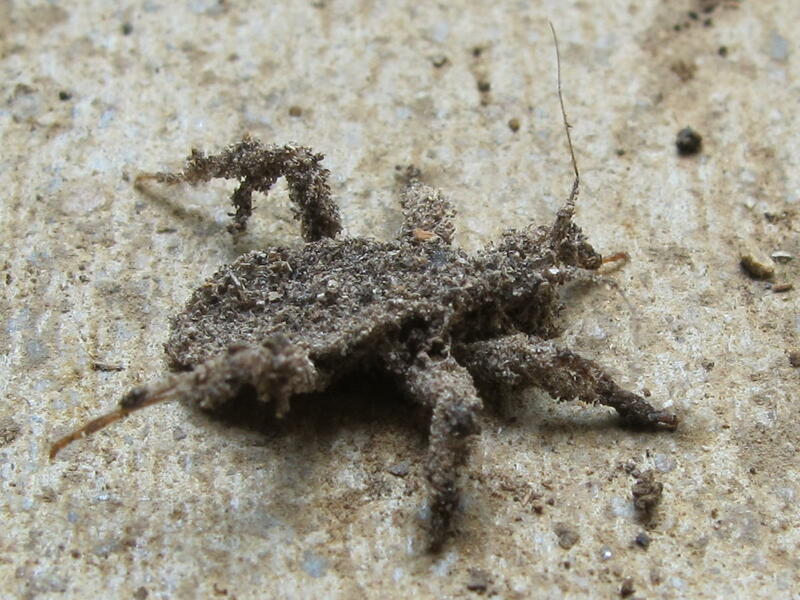 I finally got a shot that did a pretty good job of showing the distinguishing marks. 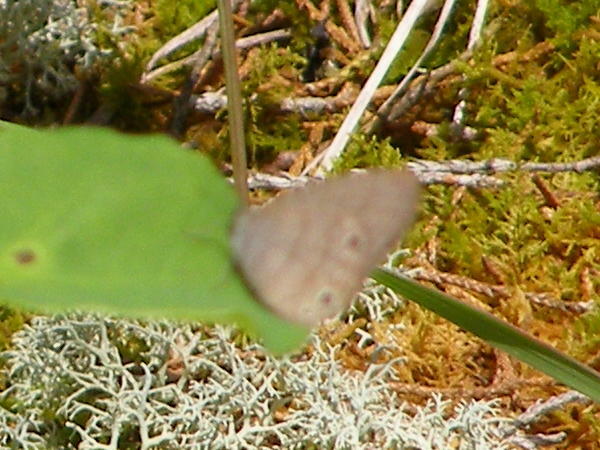 This Carolina Satyr flew over and lit right in front of me. 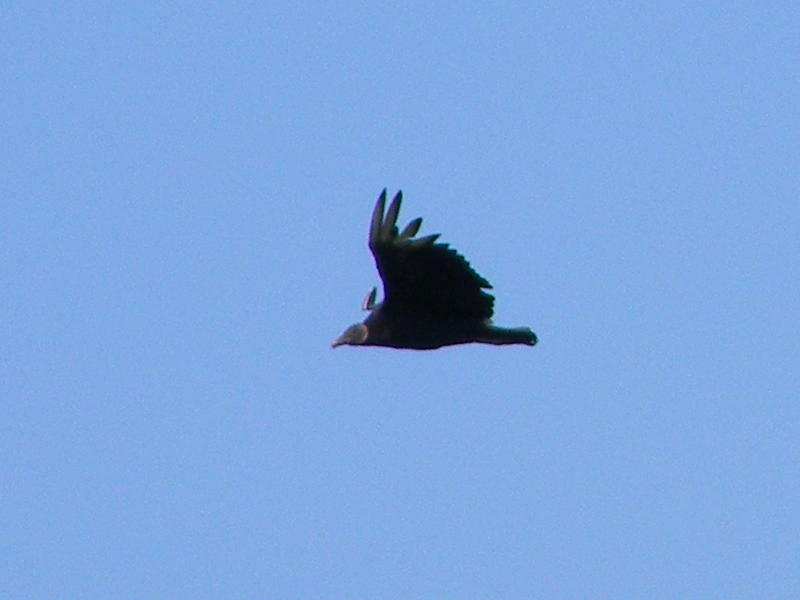 It’s my best shot of the day, but the upper wing surface is rather blah. 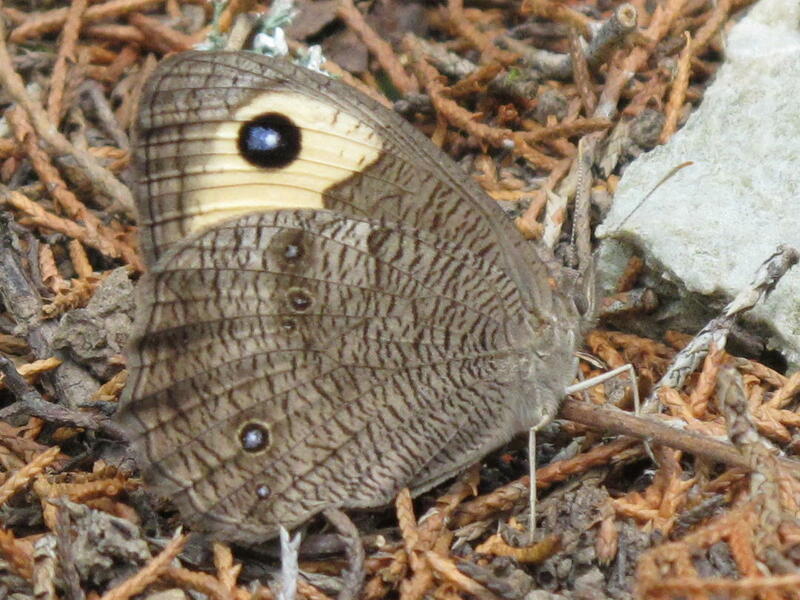 The surface of the wings looks worn and scratched, but that’s the way most published photos of this guy look. 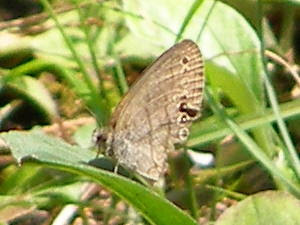 The butterfly flew as soon as I began to crouch down for a side shot. 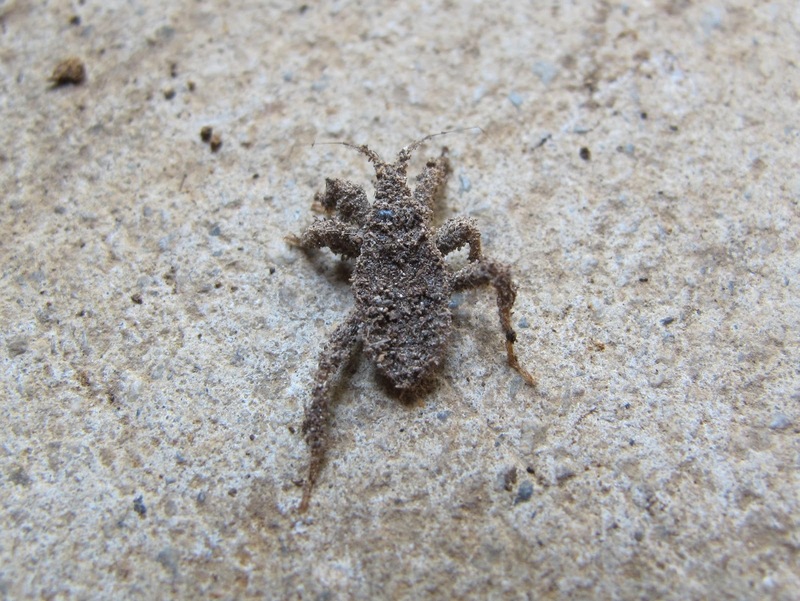 My search for Satyrs took place in the warm afternoon. Maybe I’ll have better luck if I go out in the cool of the morning. I’ll give that a try. 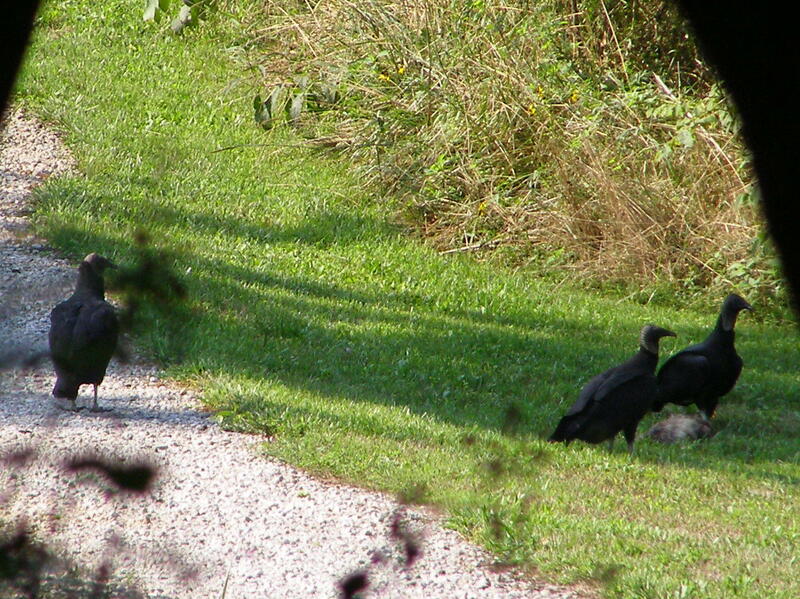 I came around the corner of the house yesterday morning and found several Black Vultures having a feast. 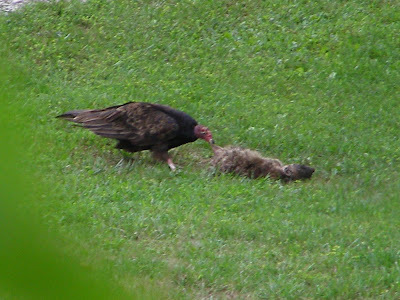 A road killed Raccoon that I had moved into the field a couple of days ago was now in the front yard. I decided to leave the carcass alone and let the vultures try to finish it off. That’s only a sound decision because my wife is away and won’t be back for a couple more days. The Vultures saw me peeking through the shrubbery and took off. They circled a couple of times and then drifted away. I went on out to the barn to do a little work. 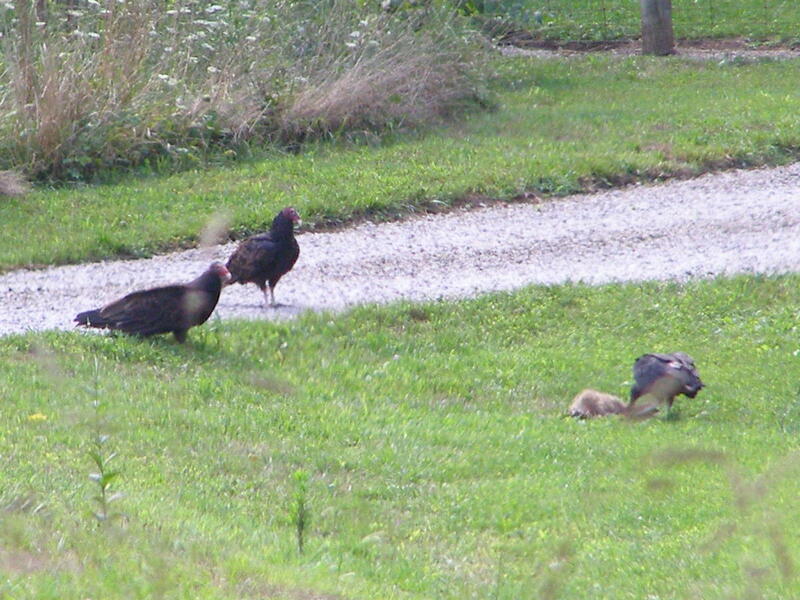 When I stuck my head out of the barn an hour later, a Turkey Vulture was standing beside the Raccoon. The heat and the fly larvae had done a good job of tenderizing the Raccoon. 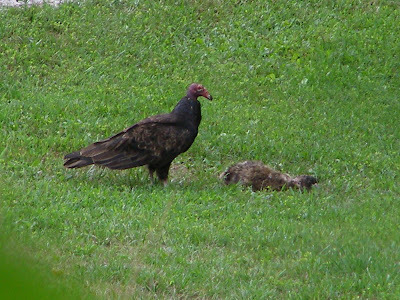 The Vulture was able to tear free some healthy bites. 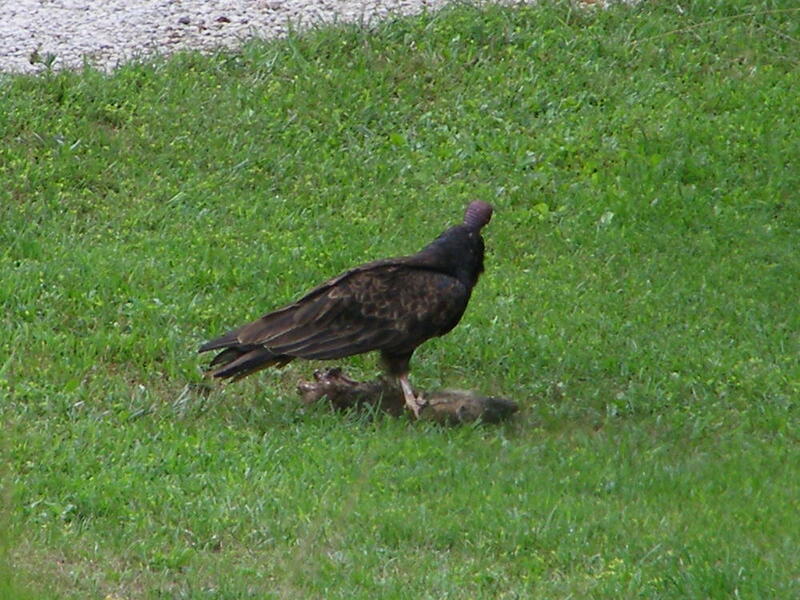 It seemed that this guy was in total control of the carrion. I went back into the barn to continue my work. When I next surveyed the scene, a single Black Vulture was eating while two Turkey Vultures looked on. At a move from the Black Vulture in their direction, the Turkey Vultures simultaneously extended their wings. The wing spread appeared to be a defensive posture in response to the Black Vultures movement, but the reading I’ve done doesn’t indicate wing spreading being used for this purpose. 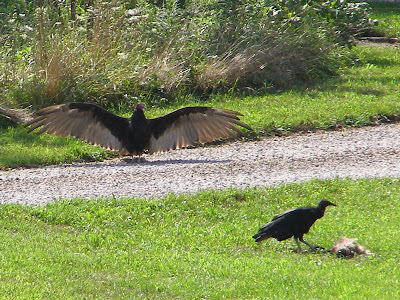 Wing spreading is supposed to be for drying the feathers or warming the body. Perhaps that’s exactly what they were doing and the apparent aggressive move by the Black Vulture was just a misinterpretation on my part. 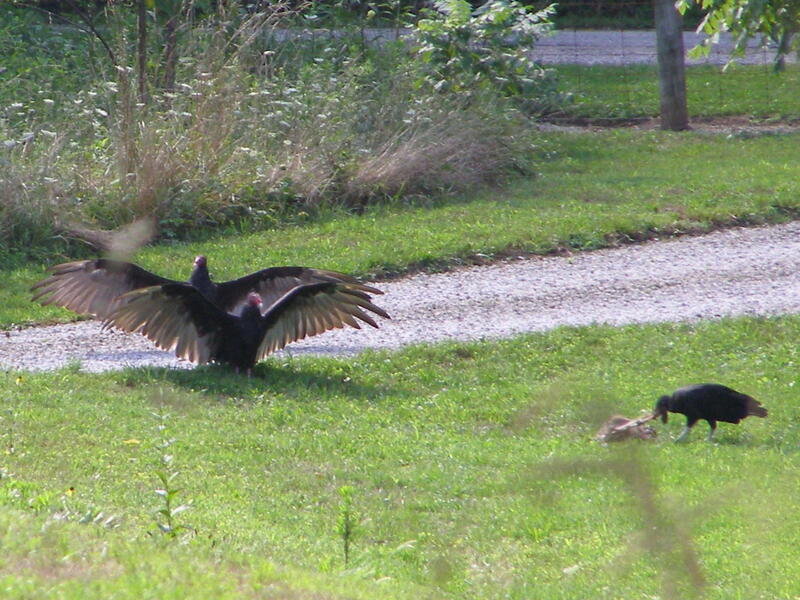 The Turkey Vultures moved away a few feet and again extended their wings while the Black Vulture continued to feed. The arrival of our mail carrier caused all of the birds to depart. I noticed them out there later in the day, but they’re going to have to really work to get things cleaned up before my wife gets back. 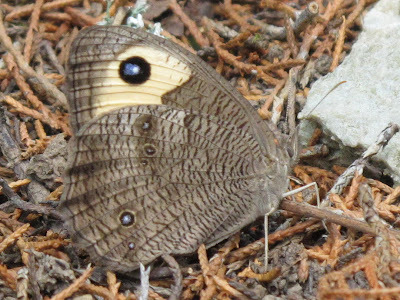 Butterfly numbers are still low, but I’m seeing several different species. 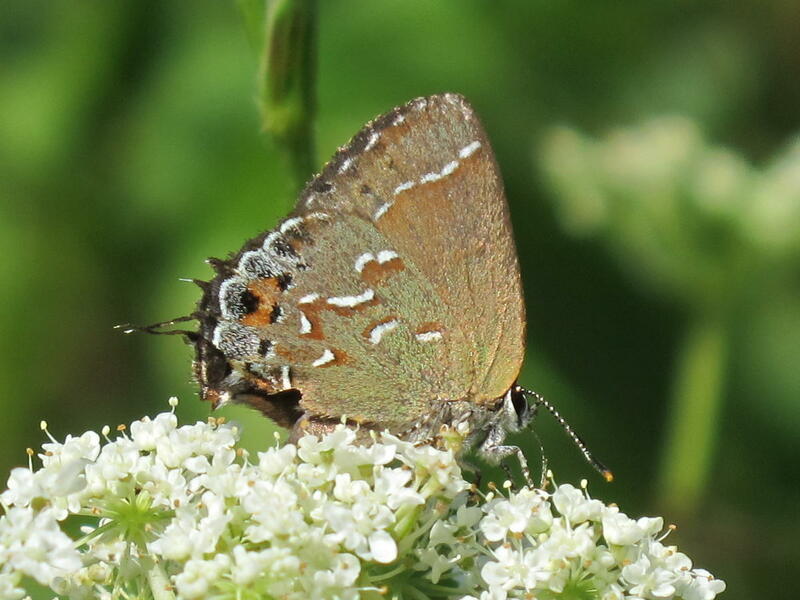 The Olive Hairstreak is trying to outdo its first brood success and is becoming more abundant every day. 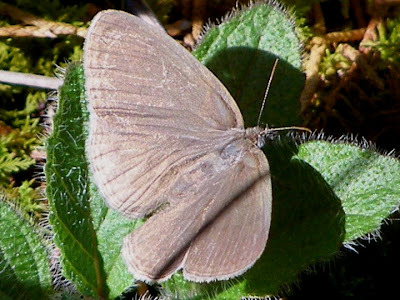 Other Hairstreaks are quite noticeably absent. Besides the Olives and two Edwards’, this Gray Hairstreak is the only other of that group that I’ve seen so far this summer. 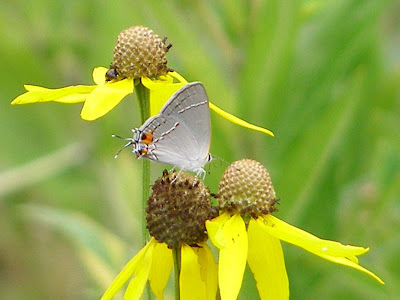 Many Hairstreak species are normally common here. It’s disturbing to have them so obviously absent. 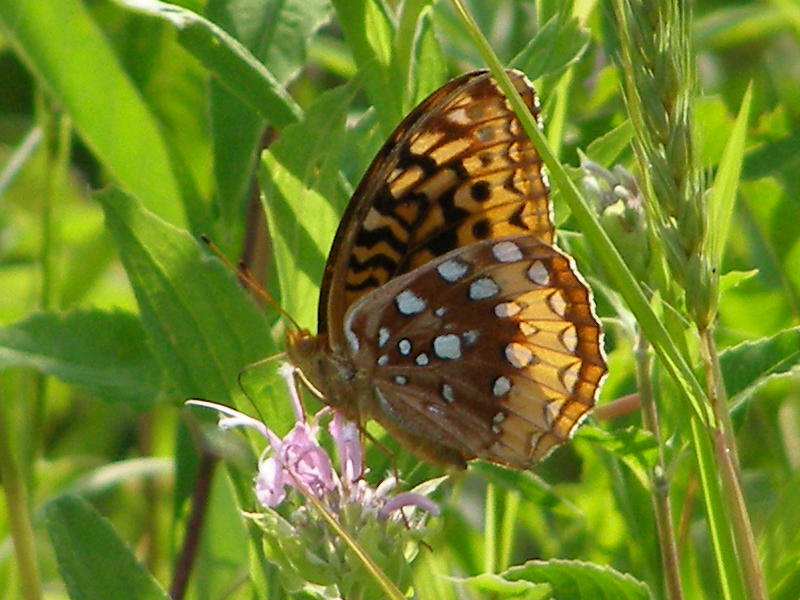 Great Spangled Fritillaries are still around in very low numbers. They’re appearing just one at a time instead of in their usual flocks. 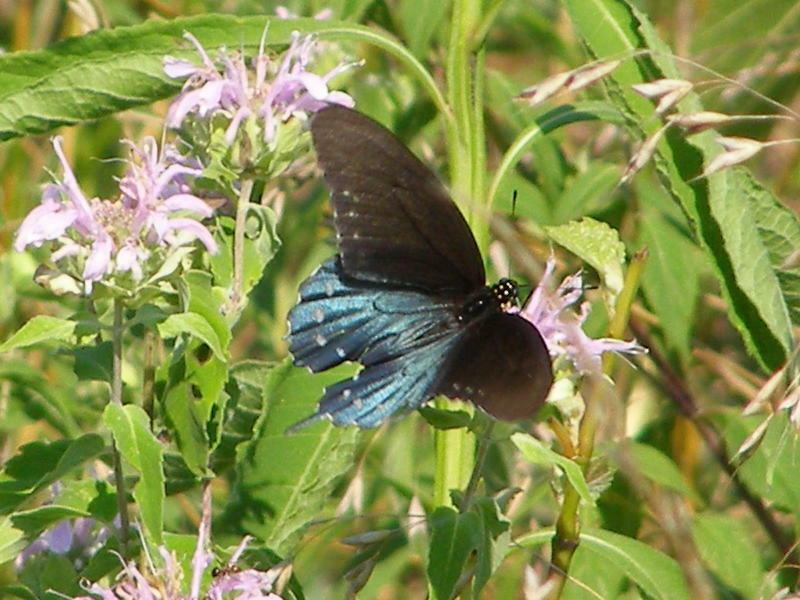 Pipevine Swallowtails are still the most abundant of the Swallowtail group. 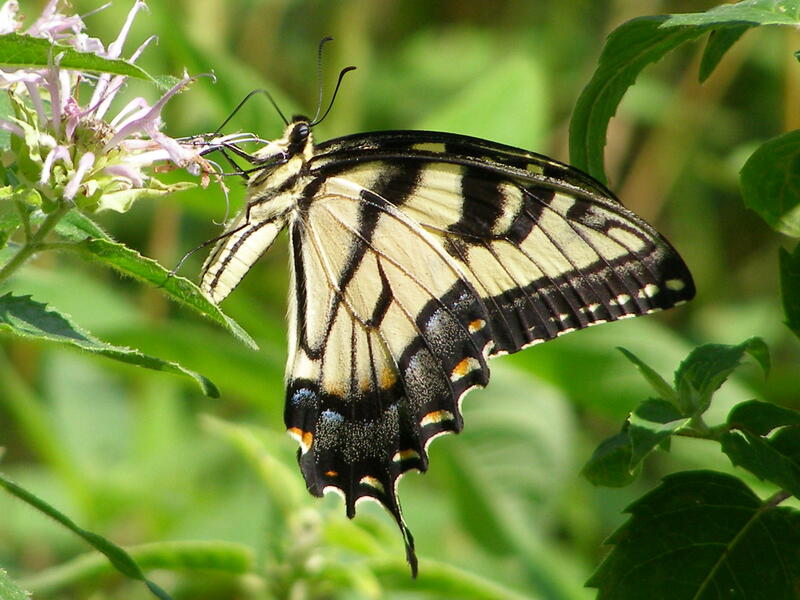 Tiger Swallowtails began showing up just a few days ago. Silvery Checkerspots seem more common this year. 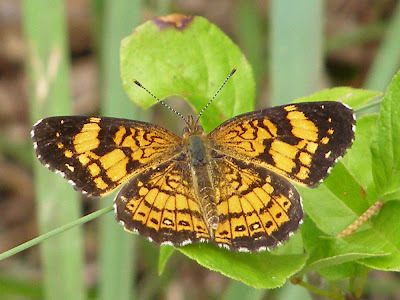 That may be because the number of Pearl Crescents, which the Silvery Checkerspots resemble, is way down. 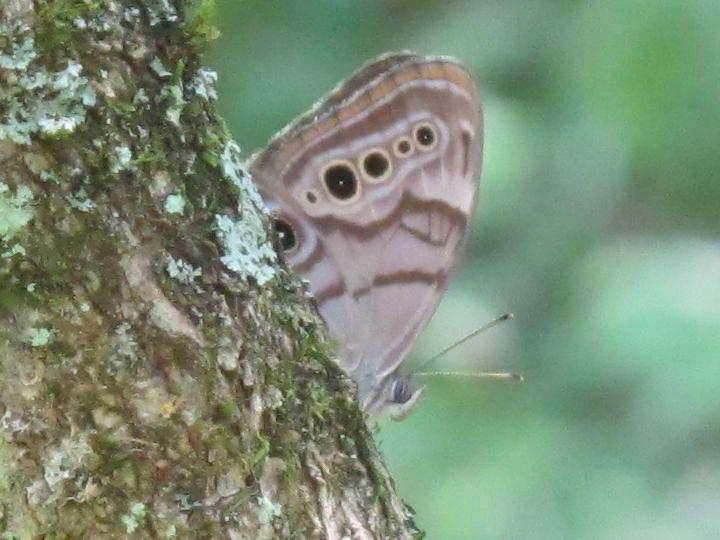 It’s hard to see the Silvery Checkerspots when Pearl Crescents are constantly flying by. Little Wood Satyrs are becoming more abundant, but are still less common than normal. I got this out of focus shot of a ragged Carolina Satyr after following the butterfly for several minutes. 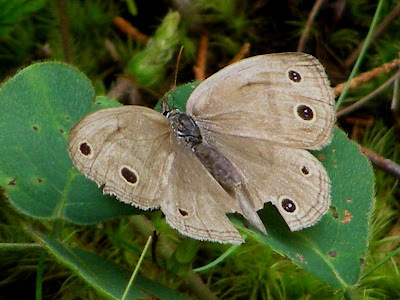 First sight led me to believe it was another Little Wood Satyr, but it had a little different look that made me want to get a closer look. It lit just long enough for me to get one quick shot from a position much too far away. 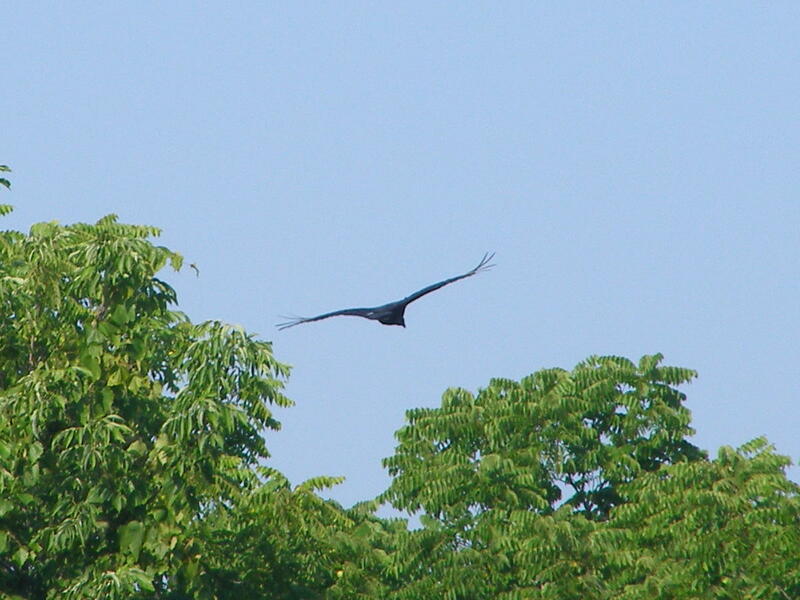 Then it took off over an embankment and easily evaded any further pursuit. Carolina Satyrs are rather rare in this area, so I guess I’ll go back out and see if I can find a nicer looking individual and get a clear shot. 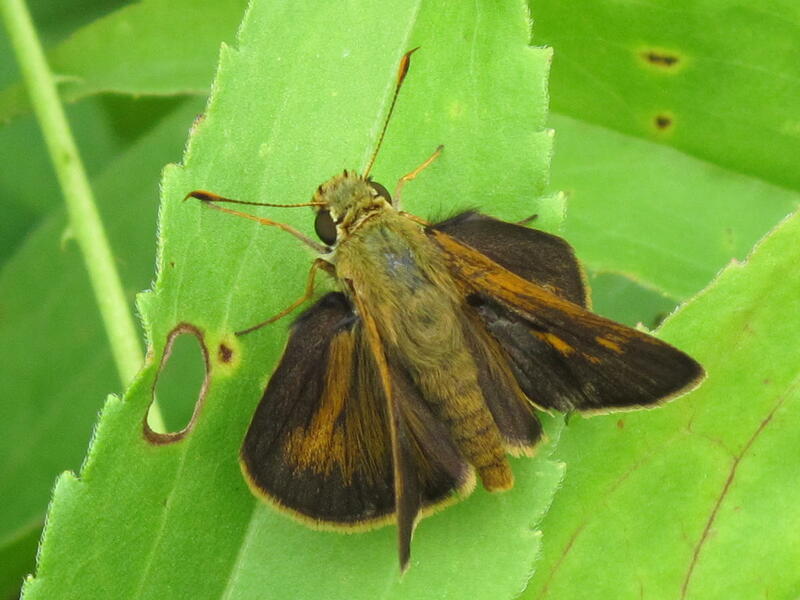 Skipper numbers seem to be about normal this year. 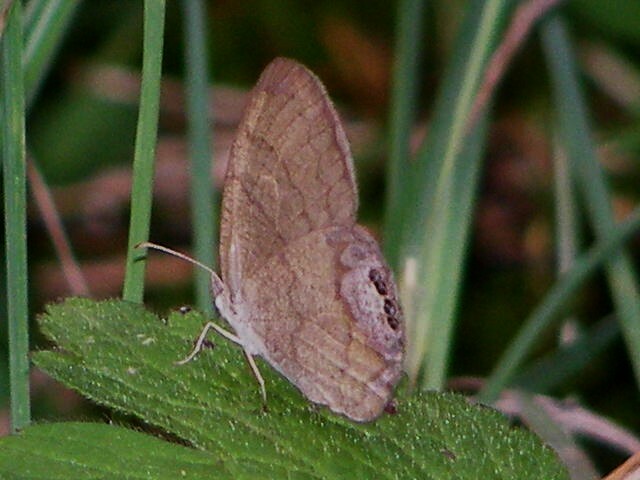 This Northern Broken Dash is one of many that appear to have emerged in unison. 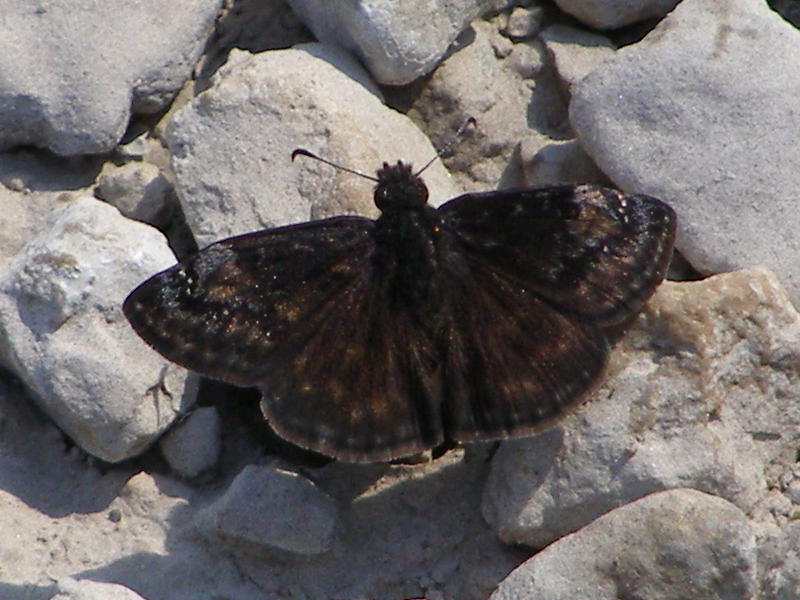 Almost as suddenly, every dark skipper is a Wild Indigo Duskywing. 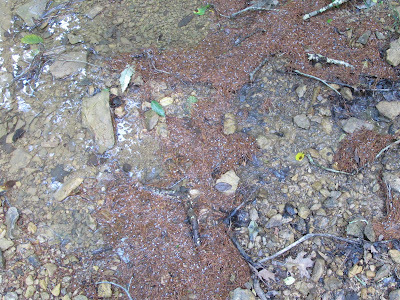 They are gathering just about everywhere they can find a bit of mineral laden moisture. 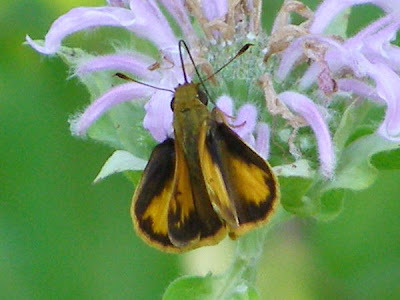 The Southern Golden Skipper is one of many skippers that will hold fore and hind wings at different angles to expose all sides simultaneously. This always fascinated me as a child and each time I saw one, I couldn’t keep from thinking about the inside of a cat’s eye marble. Of course, back then I didn’t have any camera or binoculars, so I had to employ some pretty nifty stalking skills to get a close view.